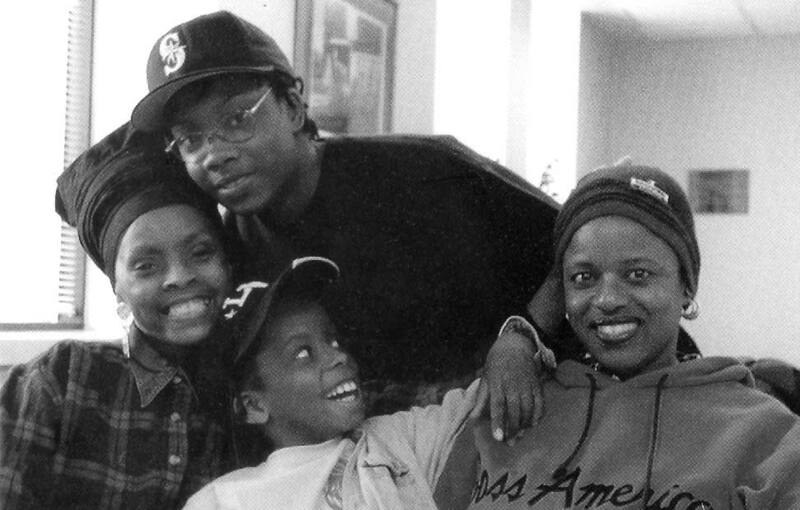 Winifred Young, left, with her two sons and her sister. Every once in a great while a book comes along that gives me so much pleasure that when I reach the end I want to start again at the beginning. Such a book is Daniel Way’s All in a Day’s Work: Scenes and Stories from an Adirondack Medical Practice, published jointly in 2004 by Syracuse University Press and the North Creek Railway Depot Preservation Association. I didn’t expect this book to wow me. It came to me out of the blue, as a gift, and after an initial browse, two things struck me. First, sampling a few pages, I found the writing earnest but sometimes awkward. Second, browsing the book’s 105 color photographs, produced in medium format by the author, I was dismayed. The images were superb, but the small size granted them on the page was shocking. Landscape photos deserving two-page spreads were reproduced like passport photos. To be fair, publishing photographic books isn’t easy. Reproduce images as handsome as these in a sensible size, and the book’s retail price soars. So publishers with shallow pockets are forced to miniaturize, for better and for worse. All in a Day’s Work is a highly original production. It’s written and illustrated by a Glens Falls medical doctor who makes the rounds of clinics scattered across the southern Adirondacks. 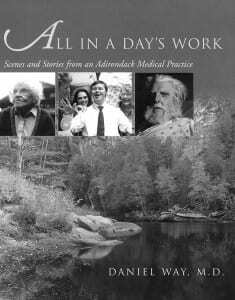 Doctor-writer-photographer Daniel Way gathered the word-pictures, close-up portraits and landscape photographs that make up this book while tending to the sick and aged in such places as Indian Lake, North Creek, Long Lake, Warrensburg, Chestertown, Speculator and Wells. Way reports that he’s traveled 300,000 miles in his work. That’s quite an odyssey, and the reader gets a rich and memorable taste of it here. One lazy Sunday morning, I propped myself up in bed, sipped a cup of coffee and gave All in a Day’s Work a chance to exceed expectations. Almost at once, I found myself caught up in the lives of Way’s proud but often suffering patients, and mesmerized, too, by his color portraits of them. Way walks a tightrope. On one side he risks falling into sentimentality and bathos, on the other slipping into clinical detachment and condescension. But the doctor walks the fine line and never falters. He’s plainspoken, honest and full of heart. Quirky men and women and the major and minor illnesses they face are presented with just the right doses of sympathy and detail. Too many books about the Adirondacks leave out or give short shrift to the region’s people. Landscapes and wildlife dominate. Way goes a long way toward countering this trend, and not by excess in the other direction. He celebrates Adirondack landscapes, and simultaneously he casts a tender light on 50 women and men every bit as craggy, untamed, rugged and beautiful as the mountains they inhabit. Here meet Isabel Brown, Bunny Annable, Mildred Prouty and Helen Donahue. Way groups the women as the “four merry widows of Riparius.” At 87, 89, 86 and 90 respectively when they posed for Way’s Bronica, they are as full of life and fun as any group of teenagers. The women get together often to play cards, trade stories and tell jokes. 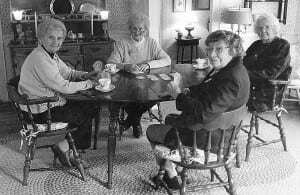 Of his visit with the widows, Way writes: “I could see for myself the powerful spiritual energy such interplay generated. I found myself wishing I could capture that energy and put it in a pill that I could then prescribe to all my patients. I had to admit that the medicine that kept these women young was not in any pill; it was their friendship.” Who can argue with that? And there’s Joe Minder, of North Creek, who fought under horrific conditions in the Philippines at the outset of World War II, then spent three-and-a-half brutal, soul-testing years in Japanese prisoner-of-war camps. The doctor/author knows when to step out of the way and let material speak for itself, and he does so here. We read excerpts from Minder’s journals that bring harrowing experiences painfully to life. In Way’s stirring photo, we see Minder at home, with artifacts relating to his ordeal—a battered canteen that saved him from certain death, for example— arranged poignantly around him. The four merry widows of Riparius. For sheer courage, there’s no pair in the book more inspiring than Knut Kristensen and Cate Mandigo. Kristensen suffers from Lou Gehrig’s disease and might have been buried long ago if not for his extraordinary will to live and do productive work. He moved to the North Country after his diagnosis, and even though confined to a wheelchair and dependent on a feeding tube and ventilator managed to design and build the house of his dreams. After his wife left him and his children could no longer cope with the hurdles of his disease, a Wevertown artist named Cate Mandigo met Kristensen, and the two fell in love. Today, Mandigo’s work (she’s a painter) flourishes, and Kristensen is writing memoirs and designing houses. They live together in Wevertown. Every doubt I had at the beginning of this book was erased by the end. Way’s All in a Day’s Work is a powerful, affecting work. It belongs on every Adirondack bookshelf and every nightstand, where it deserves to be picked up often and read again and again.